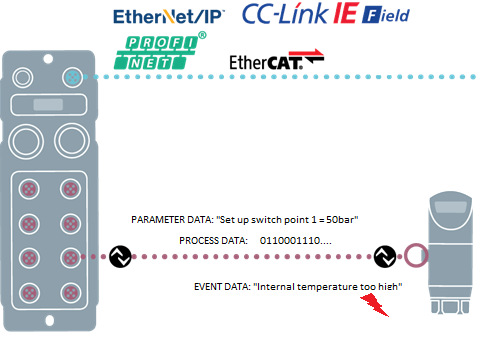 IO-Link is a point-to-point communication standard [IEC61131-9]. It is basically a protocol for communicating information from end devices to the controller and back. The beauty of this protocol is that it does not require any specialized cabling. It uses the standard 3-pin sensor cable to communicate. Before IO-Link, each device needed a different cable and communication protocol. For example, measurement devices needed analog signals for communication and shielded cables; digital devices such as proximity sensors or photo eyes needed 2-pin/3-pin cables to communicate ON/OFF state; and any type of smart devices such as laser sensors needed both interfaces requiring multi-conductor cables. All of these requirements and communication was limited to signals. 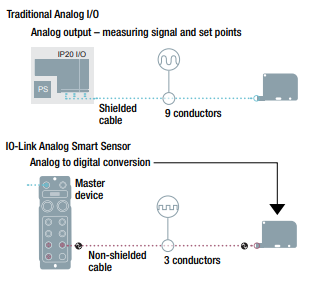 With IO-Link all the devices communicate over a standard 3-pin (some devices would require 4/5 pin depending if they need separate power for actuation). And, instead of communicating signals, all these devices are communicating data. This provides a tremendous amount of flexibility in designing the controls architectures for the next generation machines. Process data: This is the basic functionality of the sensor communicated over cyclical messages. For example, a measurement device communicating measurement values, not 4-20mA signals, but the engineering units of measurement. Parameter data: This is a cyclic messaging data communication and where IO-Link really shines. Manufacturers can add significant value to their sensors in this area. Parameter data is communicated only when the controller wants to make changes to the sensor. Examples of this include changing the engineering units of measurement from inches to millimeters or feet, or changing the operational mode of a photoelectric sensor from through-beam to retro-reflective, or even collecting capacitance value from a capacitive sensor. There is no specific parameter data governed by the consortium — consortium only focuses on how this data is communicated. Event data: This is where IO-Link helps out by troubleshooting and debugging issues. 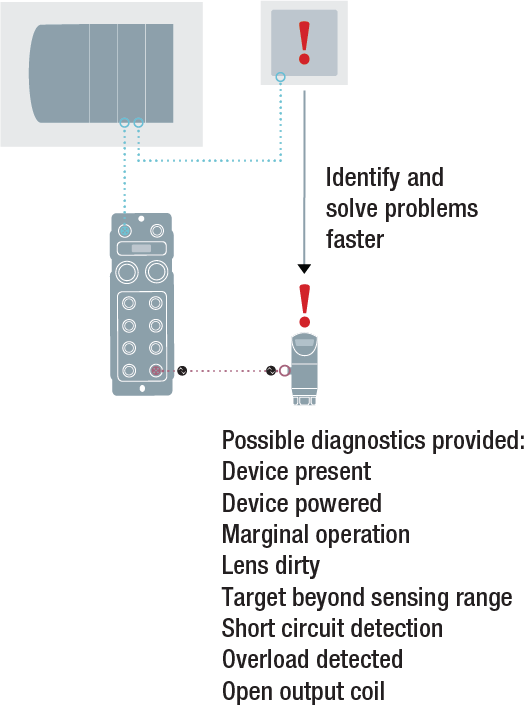 Event messages are generated by the sensor to inform the controller that something has changed or to convey critical information about the sensor itself. A good example would be when a photoeye lens gets cloudy or knocked out of alignment causing a significant decrease in the re-emitted light value and the sensor triggers an event indicating the probable failure. The other example is the sensor triggering an event to alert the control system of a high amperage spike or critical ambient temperatures. When to trigger these events can be scheduled through parameter data for that sensor. Each and every IO-Link device on the market offers different configurations and are ideally suited for various purposes in the plant. If inventory optimization is the goal of the plant, the buyer should look for features in the IO-Link device that can function in different modes of operation such as a photo eye that can operate as through-beam or retro-reflective. On the other hand, if machine condition monitoring is the objective, then he should opt for sensors that can offer vibration and ambient temperature information along with the primary function. In short, IO-Link communication offers tremendous benefits to operations. 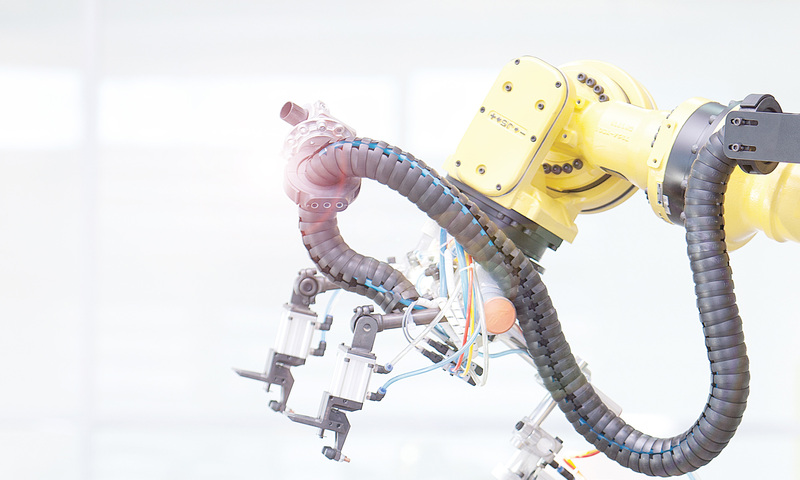 With options like auto-parameterization and cable standardization, IO-Link is a maintenance-friendly standard delivering major benefits across manufacturing.